Smart/tactical AI to play against while the beta is down. Read change log for current version information. Play like your facing an actual opponent, because the computer will not hold back. Change the player 1 race to match whatever race you want to be if the UI is bothering you. Was pretty interesting watching this AI go against Blizzard's very hard Zerg AI. Though, this AI wasn't much of a challenge for the very hard AI. Uh, it's most likely due to I haven't updated to newest version (patch 16) yet. I am about to now. Project put on hold as the beta has resumed. Will release an update when I start working on it again. Bugs: No Xel Naga watch towers or high yield minerals. There is also a weird light blue rectangle around the match duration box (The time limit thing). Probably due to the phase 2 patch. The only thing done is computer ai as terran and player either as zerg or terran. It should work with these two choices. Recently moved and won't have internet until Friday the 9th. I am still working on the map constantly. I managed to get the rebuild system working and have been fine tuning the terran vs zerg AI. When that is finished I will release v1.3. Hi, love the ai, exept. I get the param/value error, when i pick sides. And i can only seem to pick terran vs zerg or zerg vs terran. Im on a mac if that helps..
Anyways good job this far. The TvZ AI still needs a few adjustments, but overall yes it is very aggressive and mean. The Terran vs Toss is the next one I'm doing. I just got beat down 2 times in a row tring to beat terran with zerg. Havent tried terran vs terran with new update yet. but all in all definetly challenging. Removed the file as I found a serious bug that needs to be addressed. Will put it back up in a few hours. I decided to make the terran AI for the generic build against a zerg player be super aggressive so you really can't test builds. I will be releasing (in the future) options to choose what build you want the AI to go and test your build vs it. I will not be adding in levels of difficulty. I didn't add in any kind of anti-cheese rush. If you want a cheap win, own the AI every time. Whatever floats your boat. The AI should be better in this latest version. The AI attacks expansions based on blizzards actual Attack Wave AI. I uploaded a version that has some errors. Friend just tested it and the computer didn't attack him after the 1st push. Will have an updated fix shortly. on 2 run he bunker really nice but i could outexpand him because he dont atack my new exp. How can I change the race? Very very good AI. Maybe create levels of difficulty? Also I have a few issues in ZvT (only game i've played), the terrans seem to know exactly what I am building at all tims, no matter if I stop there scouts or not. In example I was intially building roaches so he went marauders. But then I built a spire in the way back of my base and right as the spire was done building about 5 vikings show up and kill my mutilsiks right as they come out. Also the terran seem a little reaper rush happy, and it is realy killing any kind of practice I want to do (mostly versus tanks), any way you can make a toggel or affect the actually AI's build order? I'll go back to loosing to the AI now, thanks for the map! Very nice AI. Love how they micro. Though I do have a few suggestions. The AI in ZvT seems to overreact when I build a certain type of unit. I built a few mutalisk and the AI just built mass thors and vikings. Then I made a quick transition to Ultras, which lead the AI with no income to counter it. I also think that in ZvT the AI should almost always have Siege Tanks, unless the Zerg is going mass air. It is the combination of the Tanks + Thors + Support (Vikings/Hellions/Marines/Mrauders) that are the most problematic for Zerg players. Ok, fixed version re-added. Enjoy. Have been working on getting the AI to rebuild. Started the system last night. Should be fully functioning in the next version. 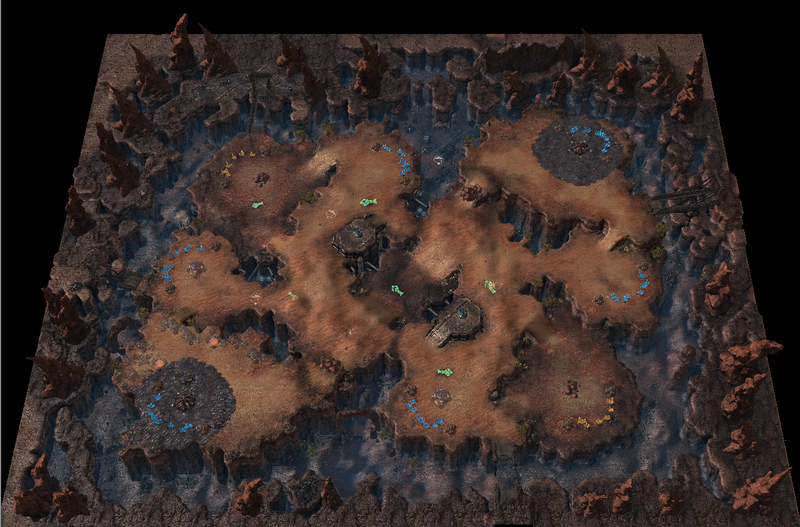 Also, the Terran AI vs Zerg will rebuild their expansions at least. Still need to make some adjustments to a few triggers that will happen next release. For now, have fun as zerg! Simple fix. I will upload the "fixed" 1.2 when I get home from class. Thanks for pointing that out OneTen4.